Piper’s Oxon appeared in 1939 and immediately demonstrated just how the perfect Shell Guide could be achieved . In so many ways Piper’s book is a masterpiece—from its arresting photographs to its gazetteer entries-- all testify to Piper’s brilliant talent for the obscure fact and the romantic image. Almost immediately it was cased by Faber. Incidentally, C & A.J .Barmby have a reasonably priced copy of a cased Batsford Oxon—all such bound Batsfords being, according to Mawson, ‘ fantastically scarce ‘ ( certainly, I’ve never seen one ). Nor have I met a spiral bound Batsford ( or even Faber ) Gloucestershire ,but there must have been one, because Faber cased a spiral bound issue in June 1939, just after taking over the series, and these are the books offered for sale on ABE at the moment at prices hovering around £100- £150—Deighton’s being the most expensive, of course. Oddly, my copy, which was published by Faber in 1939, has no spiral binding and is cased using a strange black and grey modernist cloth as if for a library, although the spine lettering is much more like the lettering of a trade binding. Also, it’s in a larger format than the spiral bound books, and has a different quality paper. From this I deduce that it may be the first title in a planned new series by Faber that never took off, possibly due to the War. I’d love to know if anyone else has a similar copy. Incidentally, Gloucestershire is a superb guide, individual and intelligent, as befits the work of H. G. Wells and Rebecca West’s love child , and it’s significant that West was also the friend and biographer of Piper ( his John Piper of 1979 is a most leftfield view of the artist). 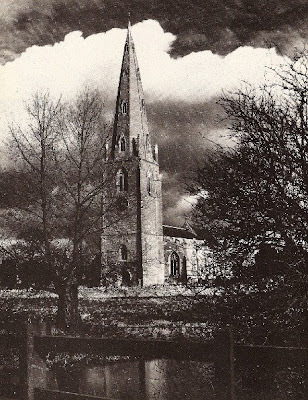 Piper and Betjeman toured Shropshire in 1939, expecting their guide to appear within a year, but the war intervened and Shropshire wasn’t published until 1951. Faber opened their great phase of Shell Guide publishing with a visually and verbally striking Guide. With its gaudy jacket in blues and orange by Piper and a wonderfully idiosyncratic, observant text, this is a truly charming title and the only Guide that the two friends wrote together. It is therefore one of the most desired titles of the post-war series. Surprisingly, there is no copy on ABE at present. Expect to pay around £30- £65. 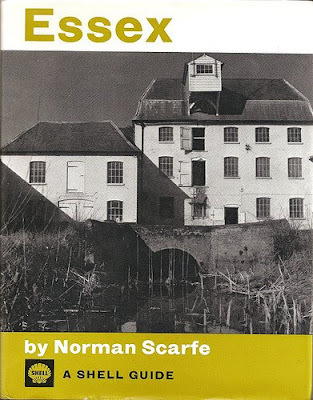 The facts that the Guides didn’t immediately resume in 1945, and that Piper and Betjeman transferred their attentions to the lookalike Murray Architectural Guides in these immediately post-war years, suggests to me that Faber had become disillusioned with the idea of continuing the series. 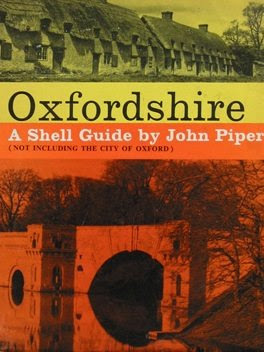 But the splendid appearance of Shropshire in 1951, followed soon afterwards by second editions of Oxon and Gloucestershire, perhaps indicate that the publisher saw a bright future for the Guides as more visually attractive rivals to the rather dull paperback Buildings of England series that had begun to appear in 1951. For their burgeoning new series Faber opted for a total redesign modelled, probably on Betjeman’s advice, on Piper’s Oxon. So, despite the incorporation of the 1930s features in, for instance, Wiltshire, such as the cod-antiquarian title page and jokey, punning ads at the back, these Guides are real improvements as guides on the early spiral bound examples, for all their obvious charm. The main difference of course is that in the improved economic climate of the ‘ never had it so good ‘ fifties, and early sixties ( as opposed to the recession-hit thirties ) the Guides were printed in larger numbers and therefore are more common today. Copies of Piper’s updated Oxon, Verey’s Gloucestershire and Wiltshire, Stephen Bone’s West Coast of Scotland and Brian Watson’s Devon are comparatively easy to find, although copies with jackets are thinner on the ground. Rarer are Verey’s Herefordshire, with Rutland, by pioneer historical geographer W.G.Hoskins, even rarer. The sixties was a decade when individual Guides began to expand in size, Faber being ever aware of the threat from the detailed descriptions offered by Pevsner. Titles from the sixties to the mid eighties, when the series finally folded, ironically with the prizewinning Nottinghamshire by Henry Thorold, are far more common and accordingly cheaper. Most can be acquired for anything from £6 to £20,, although, true to form some dealers on the Net try it on. But even in this last phase some titles are advertised as being more scarce than others. I was never aware that my own Hertfordshire was rarer in hardback. My publishers simply told me that there was a print run of 10,000, and it is entirely possible that a high proportion of the sheets were held back for the paperback edition. When Piper painted Windsor Castle in a series of Gothic extravaganzas with Dunsinanean wind and lightning George VI said "Pity you had such dreadful weather on your visit, Mr. Piper."